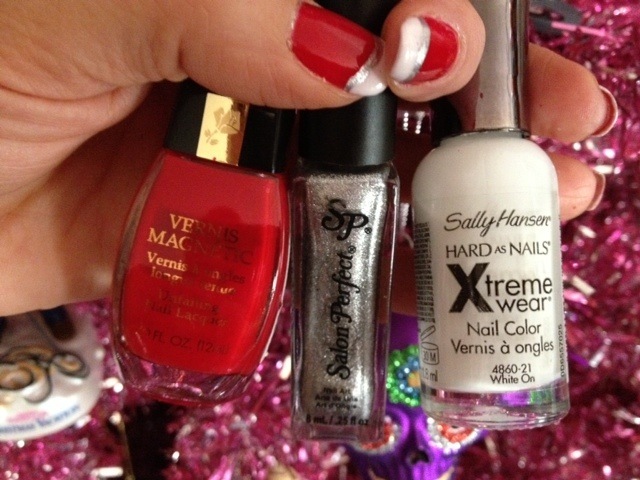 This entry was posted in FUN!, Mani Mondays, My Family, the Griswolds and tagged caption, christmas mani, christmas manicure, Christmas tree, Christmas Vacation, griswold family, lancome code red, lancome nail polish, national lampoon christmas vacation, National Lampoon's Christmas Vacation, Sally Hansen White On, Salon Perfect Silver Plated, seche vite dry fast top coat. Your nails always remind me of a woman I dated in college who gave the best back scratches ever! I saw that car ornament in Kohl’s this weekend and so almost bought it! Best Christmas movie ever! Can’t see the line, can ya Russ? It’s true – nails make for good back scratches! And as for the best Christmas movie ever – it’s true. I could probably watch it every day during December and not get sick of it! I wanted to stop by and wish you a Merry Christmas before I go on vacation. Have a great one! Oh I love this time of year. Enjoy your vacation, my friend! Merry Christmas to you and your family. Thanks for being a friend! You really nailed this post, CBXB! Yes, I love revisiting the Griswold’s at Christmas. Clark sees the light. OK, too many puns in one comment box. Yes! Way too many puns for one comment box but the possibilities are endless. 🙂 I can’t get enough of the Griswolds at Christmas. Think I’ll have to watch the movie again this weekend! Hey look kids, there’s Big Ben…! European ranks right up there with me, too. Gotta love the Griswolds! My favorite Xmas movies are Love Actually and Christmas Vacation. My FAVE scene from the movie. And, I knew we were kindred spirits but had no idea how much so until now. The two must see movies for me every year are Love Actually and Christmas Vacation! Double feature on December 25, Baby! LOVE IT! 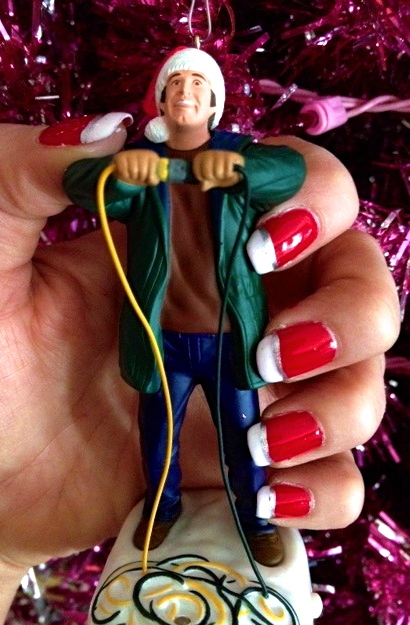 Christmas Vacation is one of my fav holiday movies, along with Elf. Oh, Elf is so good, too. Santa? I KNOW HIM! 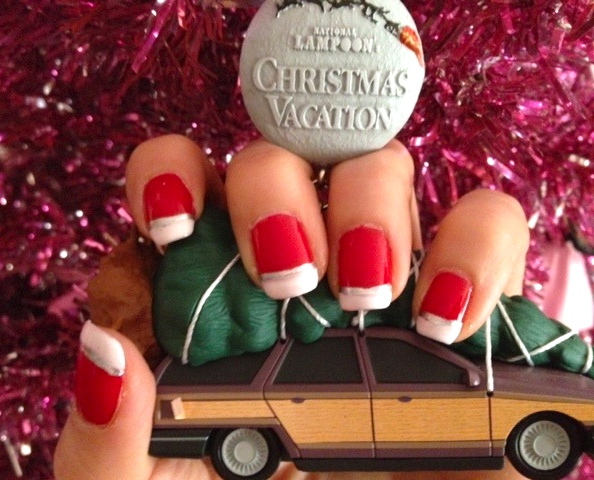 I’ve been watching the Griswolds at Christmas so long…now my kids ask for it each year too. Thanks – it was hard not to get too gaudy. I had to limit myself! Huzzah, love this movie! My whole family watched it after Thanksgiving and it was my boyfriend’s first time– he has now been inducted 🙂 Love the nails. Always impressed when I come here, always. WHAT? Your boyfriend had never seen the movie? He needs a whapatoolie shot STAT (for further family induction). We watched it after Thanksgiving too. Knew I loved you! Haha yes he does need one of those shots.. and hell, I’ll join him! He has a long way to go in his induction… and I’ll enjoy every minute of it. In the history of rants, this is the Best. Rant. Ever. I have that same Christmas ball, but in light blue! It was my Grammy’s friend’s and it’s my favorite ornament. I have never seen another! Whoa. Um, seriously?! We have the same antique ornament now?! Love the mani!! I really like the silver stripe between the 2 colors to even out the line. Merry Christmas! 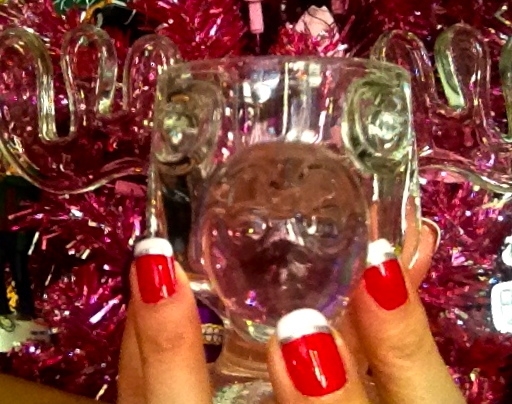 Thank you – the silver really seemed to tie the mani together. Merry Christmas to you and yours, my friend! 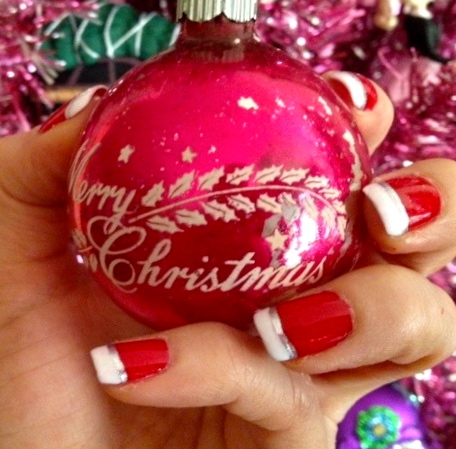 Your nails are in a very 🙂 pretty Christmas style, love them ! Thank you! It was hard not to get too gaudy with Christmas colors! Hee hee. Love these nails! I love the Griswolds! Oh yes! Fabulous Christmas indeed. Hope yours was the same. And enjoy the new year!